CAD models and supporting engineering information are the defining data set for the creation of a product. Optimizing the development and downstream use of this data, helps eliminate duplication of effort, improves efficiencies, and lowers the total cost associated with a product lifecycle. The output of this optimized CAD data can be used produce a rich source of visual based information for today’s global audience. Furthermore, these solutions can be accessed and viewed on a variety of devices, including mobile, thus broadening market/audience reach. Join us as we explore new tools and technologies that utilize optimized CAD data to support a product from conceptualization, through manufacturing, marketing, publications, training, and more. Bring your questions to the discussion as we demonstrate real-world solutions developed for industry leading manufacturers. Learn how visual solutions transcend language barriers, while communicating various types of information ranging from manufacturing work instructions to technician training. Learn new ways to further the use of CAD data through a product lifecycle. Learn how to reuse data in a way that eliminates duplication of effort, improves efficiencies, and lowers the total cost associated with a product lifecycle. Learn how this information is developed to deploy on today’s popular content platforms, including mobile. Jake Gaylord is the Program Manger of Business Development and Implementation at Almon Inc., a technical content creation company. Jake’s extensive experience as a field service technician opened the door to a career in technical documentation. 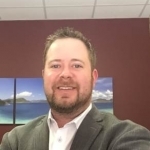 Jake accepted a position with Almon Inc. as a technical writer in 2004 and began producing technical content for the very same products he had serviced as a technician. Over the next six years, Jake assumed various project/client management duties allowing him to build strong client relationships by continuously improving processes, implementing new technology, and identifying ways to create added value for Almon’s customers. Jake was promoted to his current position in 2011 and continues to build relationships with Almon’s customers, while focusing on the reuse of visual based technical content for product training and publications purposes.